Organic luncheon servings include homemade bread sandwiches, soup and salad as presented by CREPE ESCAPE's Christine Goodale, and GREAT TASTE's Steve Boss & Kathy DuBois. S.E.E.D. Center is adjacent to Abundance EcoVillage. Entertainment and brief presentations celebrating solar-powered KRUU-FM's 20-part statewide energy efficiency and sustainability series, funded by the community with a matching grant from the Iowa Power Fund's Office of Energy Independence. 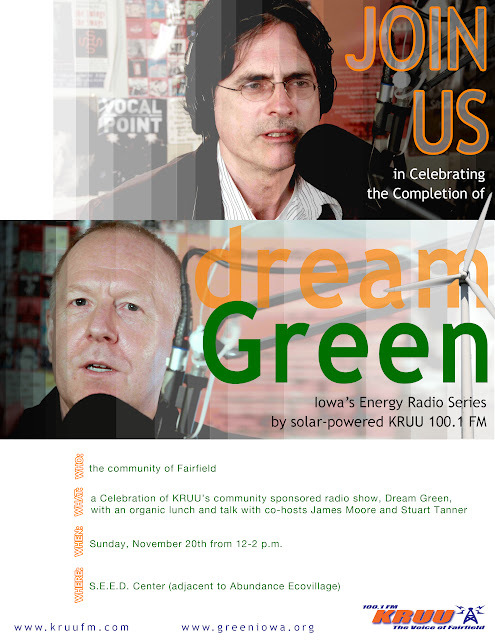 Heartfelt thanks to the community not only for making this series happen, but for making KRUU the Midwest's first solar-powered radio station and a vital part of Fairfield's do-it-yourself connect-the-dots inner outreach.